Irregular expenses – expenses that occur only once or a few times per year – are the bane of the grad student budget. As stipends are so limited, it is rare to find a graduate student whose money management system hasn’t been stressed by an irregular expense. Examples of irregular expenses common to grad students are quarterly or yearly tax payments, university fees or research-related expenses, travel, insurance premiums, repair/maintenance costs, shopping (electronics, clothes, home, etc. ), entertainment, and gifts. 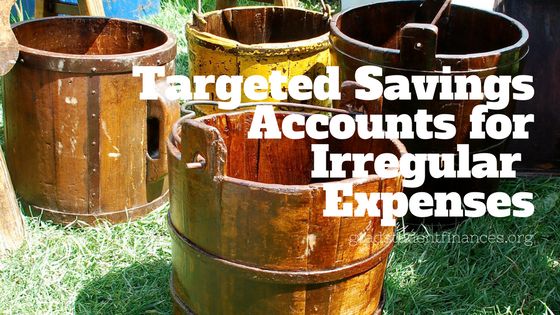 The best way to handle irregular expenses is to save for them in advance. First, you’ll have the cash on hand when the irregular expense occurs, eliminating the need to scramble to find additional cash flow that month or to carry a balance on a credit card. Second, anticipating your irregular expenses forces you to budget over the course of a year instead of just a month, which means you can better weigh your spending options against one another instead of making last-second calls on what to purchase and what to forgo. A system of targeted savings accounts organizes your savings for irregular expenses. From each paycheck, you save a small amount of money into each targeted savings account, which are designated according to their expense category. Then, when an irregular expense occurs, you pay for it using the money that has built up in the targeted savings account. Would you like a one-page worksheet that helps you brainstorm your irregular expenses? It includes the three questions to ask yourself to map out your upcoming year and a list of the most common irregular expense categories. Sign up below to receive your worksheet! Further Reading: Weather Irregular Expenses on Your Grad Student Stipend with Targeted Savings Accounts (a Personal Finance for PhDs Guide); A Simple Trick to Save More Money (It Isn’t Automating); Are These Budget Busters Derailing Your Spending Plan?